It's official. India’s Mars Orbiter Mission will be launched on November 27, 2013. The Indian Space Research Organisation (Isro) on Monday expressed confidence that it would be able to launch the ` 450 crore mission to the Red Planet in the very first available launch window, which is Nov 27, 2013. The available launch windows for the Mars mission in this decade are 2013, 2016 and 2018. The years are divided by taking into consideration the proximity of Mars to Earth. “The orbiter will be launched by the PSLV XL launch vehicle, after which its apogee will be increased from 20,000 km to 2 lakh km before it begins its voyage for Mars,” said Isro chairman K Radhakrishnan. It takes about 300 days (nine months) for the Mars probe to reach the Red Planet. Radhakrishnan said the Mars Orbiter will carry nine scientific instruments on board to study the Martian surface, the planet's atmosphere and its ability to sustain life. India will be the sixth country to launch a mission to the Red Planet after the US, Russia, Europe, Japan and China. India is all set to give the go-ahead for an ambitious mission to Mars, expected in November next year, a top Space Department official said here on Saturday. “A lot of studies have been done on the possible mission to Mars”, Secretary in the Department of Space and Chairman of Indian Space Research Organisation K Radhakrishnan told reporters here. “We have come to the last phase of approvals”, he said. .
“And I am sure that, maybe soon, we will be hearing an announcement on the Mars mission“. According to ISRO officials, a significant amount of work on the planned Mars mission has been completed and scientific payloads have been short-listed. 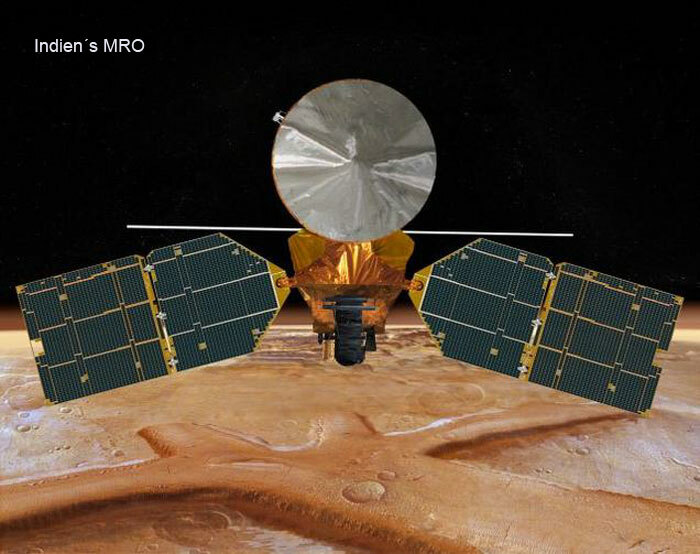 The project report for Indian Mars Orbiter mission has been submitted for government approval. The mission envisages launching an Orbiter around Mars using Polar Satellite Launch Vehicle (PSLV-XL). The Orbiter will be placed in an orbit of 500 x 80,000 km around MARS and will have a provision to carry nearly 25 kg of scientific payloads on-board. The tentative scientific objective for the Mars mission will be to focus on life, climate, geology, origin, evolution and sustainability of life on the planet,” according to ISRO. Scientific payloads have been short-listed by ISRO’s Advisory Committee for Space Sciences (ADCOS) review committee. Baseline, solar array and reflector configuration of the satellite have been finalised, the Bangalore-headquartered space agency said.